Mulberries are fruits that are loved for its taste and nutritional benefits. It is sweet and looks very similar to the blackberry fruit. It is usually eaten in the dry form. The leaves of the mulberry tree are used for rearing silkworms. The leaves have numerous medicinal properties as well. Read on to know how it can benefit you. Like all berries, mulberries contain lots of anti-oxidants. These are very beneficial for controlling ageing. They are well known and very effective anti-ageing agents. The properties of mulberries help you by clearing out dark spots and getting rid of all kinds of blemishes on the facial skin. Steep a few mulberry leaves in coconut or olive oil for a few days and apply the oil on your skin. Extremely dry skin can be easily treated this way. You can also use it with some lotion to treat dry skin and sensitive skin that is prone to irritations. Bath salts and soaps made of mulberry make your skin soft and radiant. Using the leaves in hot baths and saunas open your pores and detoxify your body. Infused mulberry leaves are contained in this steam, which makes your body sweat and hence regulated the metabolism of your body. 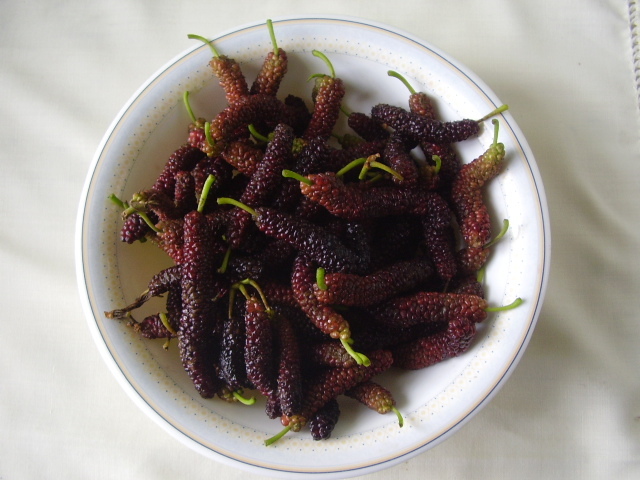 The synthesis of melanin is regulated by eating mulberries. As such, your skin gets clear and bright. Eating the fruit, drinking the juice of the fruit or having mulberry tea is very useful for rejuvenating your skin. If you leave the leaves of the tree in a pot of hot water for around 30 minutes and then use it, all kinds of skin problems can be treated. It also treats sore throat, fever, and cold. Mulberry juice can promote hair growth if you apply it on your hair. Mulberries make your hair healthier, promote the growth of hair, and rejuvenate your hair follicles. Hair loss is prevented, and it benefits cancer patients to get back their lost hair as well. Mulberries enhance the production of melanin in your hair, and retain the natural hair color. It helps people suffering from premature graying. Drinking mulberry juice makes your hair healthier. Consuming mulberries regularly improves the functioning of your digestive system and enhances your appetite level. Mulberries are commonly used as a blood tonic in Chinese medicine. They are used for cleansing the blood, improving the circulation, and also to strengthen the entire system. It has the property to enrich the blood, and also soothe and calm your nerves. It promotes the metabolism of alcohol as well. The internal secretion is balanced and your immunity is increased if you eat mulberries. The production of fluid in your body is enhanced. People suffering from dehydration also benefit from this fruit. People who suffer from the problem of body fluid deficiency will benefit by taking 10 mg of mulberry on a daily basis. A glass of mulberry consumed daily helps improve your vision. He content of Vitamin A in mulberries makes your eyesight stronger and relieves the strain on your eyes. This is very beneficial for people who need to spend hours working on the computer system. The main cause of retina degeneration and eye sight loss is the presence of free radicals. Mulberries protect your eyes by fighting against these free radicals. Anthocyanin is a component contained in the mulberry fruit that has the capability to cure a number of diseases. Eating mulberries daily can prevent and treat these diseases. It also finds use as a natural food colorant. Your cholesterol level is kept under control if you eat mulberries on a daily basis. Resveratrol is a potent phytonutrient that is contained in abundance in mulberries. This ingredient is capable of preventing cancer. The level of antioxidants contained in mulberries is also quite high. This stunts the growth of the prostrate cells and the growth of tumor. Consumption of mulberries is very good for the health of your heart. It can make your nervous system stronger and reduce the level of bad cholesterol in your blood. This prevents the blockage in blood flow, and helps prevent strokes and heart attacks. The compounds contained in mulberries support the balance of sugar and help control the level of blood sugar in people suffering from diabetes. Flavonoids are present in mulberries, which help in preventing the rise and fall of the level of sugar in patients due to the spike in sugar level. Mulberry has got the property to improve the circulation of blood and also act as an anti-inflammatory agent to lower the blood pressure. As such, this lowers the risk of acquiring blood clots and strokes. Mulberry is beneficial in making you less susceptible to these issues. If you have the problem of anemia, mulberry juice can help you alleviate the symptoms. Above all these, all your heart diseases are also prevented. Mulberry contains high amounts of Vitamin C and flavonoids. These make the fruit a natural immune booster. A better immunity helps prevent cough and cold, flu, and several other ailments and diseases. Mulberry is also known to solve gastric issues and chronic hepatitis. Mulberry juice is very useful for post operative patients. It is known to accelerate the process of healing, improve the circulation of blood, and even prevent the acquirement of any infection. It usually speeds up the recovery after birth, and is commonly used after surgery as an inflammatory solution. Mulberries are known to cleanse the liver and make your kidneys stronger. A really informative & amazing article regarding the importance of mulberries in our daily life as vital remedy in most health disorders.